Welcome to Smile Garden Dental Center, the premiere dental practice of Roland Park, Baltimore, and the office of Dr. Erlinda Embuscado Jameson. Our mission is to provide to you and your family the same level of quality and friendly care that we want for our own family. We treat children and adults: your entire family. Click here to use our online appointment scheduling service. If you need an emergency appointment, please call for more prompt attention. We accept all insurance, and are in network with PPO plans from the companies shown above. We do not participate in any HMOs, Medicare, or Medicaid. Connection Dental represents a large collection of dental insurance providers. Here is a PDF of the full list. For patients who are covered by any other dental insurance, we will be happy to file all claims on their behalf, but those patients will be responsible for any fees not reimbursed. We are always welcoming new patients and we would love to have you as part of our dental family. Please explore our web site to learn more about us. You can find information about our staff, our office, and the procedures and services that we offer. If you have any questions please call or email us. We love hearing from our patients and anyone who may be interested in becoming one. We provide a complete range of dental care and coordinate care with various dental specialists when appropriate. By constantly updating and improving our skills, technology, facilities, and the services we offer, we hope to be your dental care providers for life. The office is located in Roland Park – the first planned subdivision in the United States. Banks, a post office, a public and private school, a grocery store, bookstore, pharmacy and gift shop are all part of the area. We hope you enjoy the casual yet professional environment we prefer. We hope you feel comfortable enough to ask questions, talk with us about your concerns and share with us your opinions of how you want your teeth to look and your oral health to be maintained. 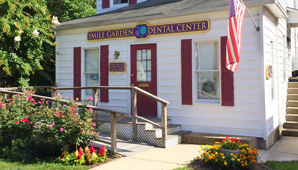 Smile Garden Dental Center, Baltimore Dentist. Dr. Erlinda Embuscado provides Family Dentist, Cosmetic Dentist, Dental Hygiene, Same Day Dental Emergency, Tooth Whitening, Childrens Dentist, Dental Insurance to the following locations: Roland Park, MD, Towson, MD, Cold Spring, MD, Mt. Washington, MD, Mt. Vernon, MD. Roland Park, MD Dentist providing excellent dentistry including Family Dentist, Cosmetic Dentist, Dental Hygiene, Same Day Dental Emergency, Tooth Whitening, Childrens Dentist, Dental Insurance in Baltimore, Roland Park, MD, Towson, MD, Cold Spring, MD, Mt. Washington, Maryland.